Julia Buckroyd is Emeritus Professor of Counselling at the University of Hertfordshire. From 2002 -2008 she was Professor of Counselling and from 2004-2008, Director of the Obesity and Eating Disorders Research Unit. 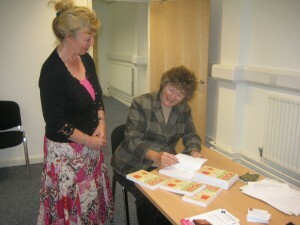 In 2011 she was made an Honorary Fellow of the British Association of Counselling & Psychotherapy. She has been working in the field of eating disorders since 1984. Her original training was as an academic historian but she re-trained first as a counsellor and then as a psychotherapist with the Guild of Psychotherapists. Her first post as a student counsellor in 1984 was at London Contemporary Dance School where she became interested in eating disorders. Her first book on eating disorders, Eating Your Heart Out, (2nd edition, Vega, 1996) derives mostly from this experience. Her new book is callled Understanding Your Eating: How to eat and not worry about it (Open University Press, 2011) and is available to buy at Amazon.co.uk. From 1994- 2008 she worked at the University of Hertfordshire while continuing her clinical work as a therapist. Her work with dancers, including work relating to eating disorders was published in The Student Dancer (Dance Books, 2000). In the past ten years she has applied the insights of therapeutic work with eating disorders to obesity, as well as continuing her work on eating disorders, and has been carrying out a research programme to explore whether psychotherapeutic groups for obese women are effective in creating sustained weight loss. This work is ongoing with a programme of research in this area. Her account of this research and the group programme that she developed was published in Aprll 2007 (Julia Buckroyd and Sharon Rother, Therapeutic Groups for Obese Women; a group leader’s handbook, Wiley). She has also sought to support work on psychological aspects of all forms of disordered eating via conferences and publications. She and Sharon Rother completed an edited book in this area (‘Psychological Aspects of Eating Disorders and Obesity’, Wiley) published in February 2008. Since her retirement from the University of Hertfordshire she has been applying her research to clinical work including a pilot obesity service in a PCT. She has also developed a programme for emotional eaters available to the general public, Understanding your Eating, which is being developed as a commercial project (www.understandingyoureating.co.uk). Interested counsellors and health professionals with a particular expertise and experience in eating disorders or obesity, can train to deliver this programme. In addition, Professor Buckroyd offers supervision, workshops and consultancy to a wide range of organisations on psychological approaches to all forms of disordered eating. 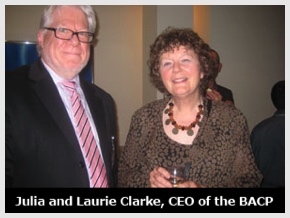 For four years, from January 2004 to December 2007, she was editor of Counselling and Psychotherapy Research, the research journal for BACP. In this role she continued the journal’s mission to make research accessible to practitioners and to support the development of counselling and psychotherapy research in the UK. In the past ten years she has applied the insights of therapeutic work with eating disorders to obesity, as well as continuing her work on eating disorders, and has been carrying out a research programme to explore whether psychotherapeutic groups for obese women are effective in creating sustained weight loss. This work is ongoing with a programme of research in this area. Her account of this research and the group programme that she developed was published Therapeutic Groups for Obese Women; a group leader’s handbook, (Julia Buckroyd and Sharon Rother, Wiley 2007). She has also sought to support work on psychological aspects of all forms of disordered eating via conferences and publications. In 2008 she and Sharon Rother also completed an edited book in this area Psychological Aspects of Eating Disorders and Obesity (Julia Buckroyd and Sharon Rother, Wiley 2008). This same programme is now being delivered in inner west London boroughs. Since her retirement from the University of Hertfordshire she has been applying her research to clinical work including a pilot obesity service in a PCT. She has also developed a programme for emotional eaters available to the general public, Understanding your Eating, which is being developed as a commercial project www.understandingyoureating.co.uk. Interested counsellors and health professionals with a particular expertise and experience in eating disorders or obesity, can train to deliver this programme. In addition, Professor Buckroyd offers supervision, workshops and consultancy to a wide range of organisations on psychological approaches to all forms of disordered eating.